One Dad's Craft Beer Blog. Advertised as Tired Hands’ exceedingly aromatic pale ale made with oats and hopped with a blend of Amarillo, Simcoe, and Centennial. 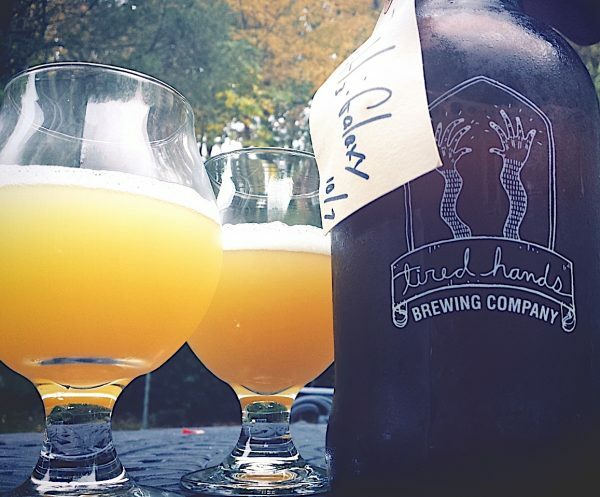 The base beer is Hop Hands 89 points that has been double dry-hopped. Galaxy hops provide such a nice orange citrus and mellow zest flavor. Remarkably drinkable and flavorful for only 4.8% ABV. I’ll put D2H3 Galaxy a couple of ticks ahead of Hop Hands at 91 points. The Brew Cafe is the brewery’s original location at 16 Ardmore Avenue in Ardmore. Currently serves food and beer. 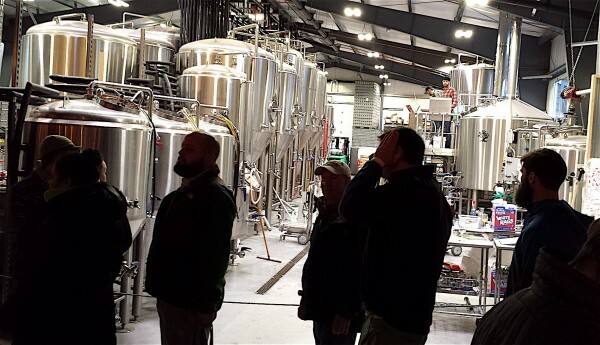 The Fermentaria is the brewery and tasting room located at 35 Cricket Terrace in Ardmore. They also serve an extensive menu of food. The General Store is located at 20 Ardmore Avenue and they sell cans to go and merchandise. 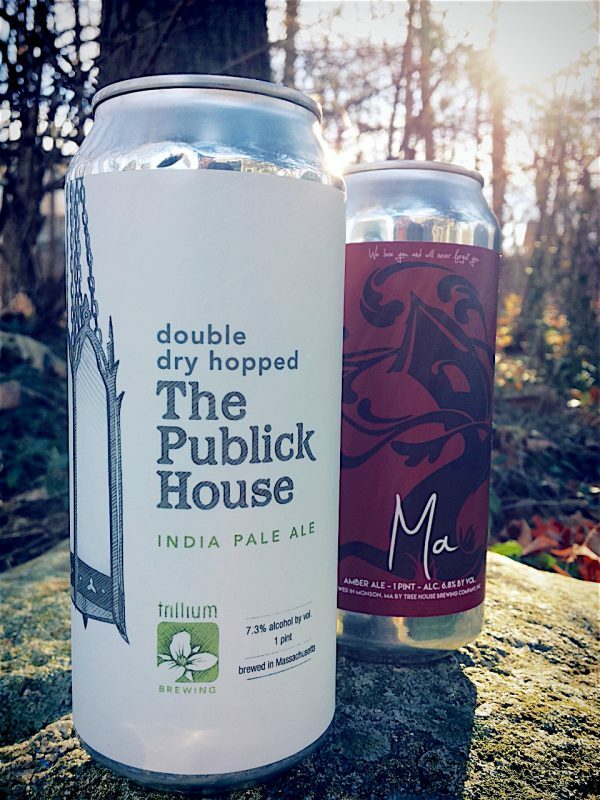 Double Dry-Hopped The Publick House & Ma in the morning sun. Hey John, we haven’t met but I’d like to thank you for sending these two gems along to Chris. When Chris asked if I might want anything from Tree House, I laughed. I know the limitations of their offerings and doubted anyone would share their minimal haul. This really made my day. Because I have a problem, I’ve created a log of Tree House’s weekly releases over a six month period. Ma seems like a sparsely occasional release and I see another beer called Pa. Seems like a matched set. In commemoration of our head brewer and co-founder’s grandmother’s birthday, we have once again brewed this super fruity yet balanced amber ale! Hints of oranges, tangerines, and stone fruit grace the palate before a sweet malty caramel character provides balance and depth. A real treat that drinks well on any occasion. Happy Birthday, Ma. We love you! Ma is a very special amber ale brewed in remembrance of Nate’s grandmother. A fiery Irish spirit who imparted deep values of dedication to family and love, Ma was one of a kind. This beer mirrors her spirit with bright notes of citrus, pine, and soft fruit boosted by a rich caramel base and a medium body. A wonderful beer to celebrate the New England transition to cooler weather. We encourage you to drink to honor Ma and to those whose souls we carry deep in our hearts. I get the caramel that is typical in this style layered under some wonderful fruit flavors. Mostly apple, white grape, tangerine and some underlying pine. Seems like there’s more fruit as I work my way through this can. Ma is entirely drinkable and enjoyable. In conclusion, Ma gets 92 points. 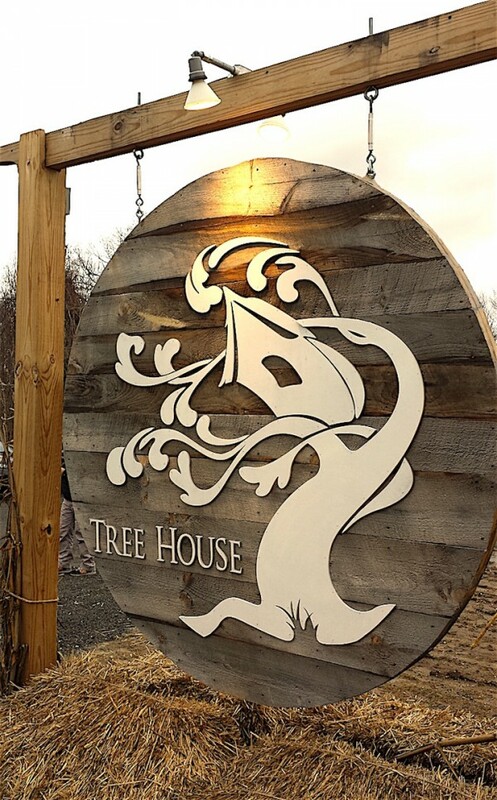 We went to Tree House for their explanation on Ma therefore it’s only fair to go to Trillium for their take on Double Dry-Hopped The Publick House. Brewed in appreciation of The Publick House, a craft beer mecca in Brookline, MA where close friends and warm hospitality welcome us time after time. The Publick House IPA features Citra, Centennial, and Columbus hops with an aroma bursting with fresh orange juice and under-ripe peach along with notes of toasted malt. The flavor profile is more bitter than our “Street” IPAs, but with a toasted, bready malt character to balance. Bitter grapefruit flavors emerge with mild pine on the finish. I have a rule of thumb that says anything double dry hopped or dry hopped from Trillium will be awesome. Additionally, I have a rule that any pale ale or IPA from Trillium will be awesome. It seems like I don’t need to clue you in on how I think Double Dry-Hopped The Publick House will turn out. Rather dank. In addition to their typical pithy style, this IPA delivers some nice pear and tangerine rind. I also get mild peach and candy sweetness. In conclusion, Double Dry Hopped The Publick House gets 94 points. I worked with an older man and he would start every story with, “Tell me if I’m repeating myself.” I didn’t mind but now I know what he’s talking about. I’ve told the same stories a thousand times and I can’t keep track of my audience. Since I have more than 800 blog entries covering about 1,000 beers, I’ve repeated myself here and more than a few times. This old style ale is a rye-based ale and the use of rye as a brewing grain may seem unusual to some. The primary grains used in the production of beer are commonly known as “breakfast grains.” The big six are barley, oats, rice, wheat, corn and rye. Barley is by far the number one grain used in beer and comes in hundreds of varieties. While the use of rye is growing in popularity, it is still usually paired with barley. The rye bill should be evident enough to impart a spiced flavor. This offering is from 2015 and has been aging in my cellar for more than a year. Nice cork and cage presentation. I’ll also note this is from Boulevard Brewing’s Smokestack series. More than likely this is available at better New Jersey beer stores. Probably $13 for this bomber-sized bottle. 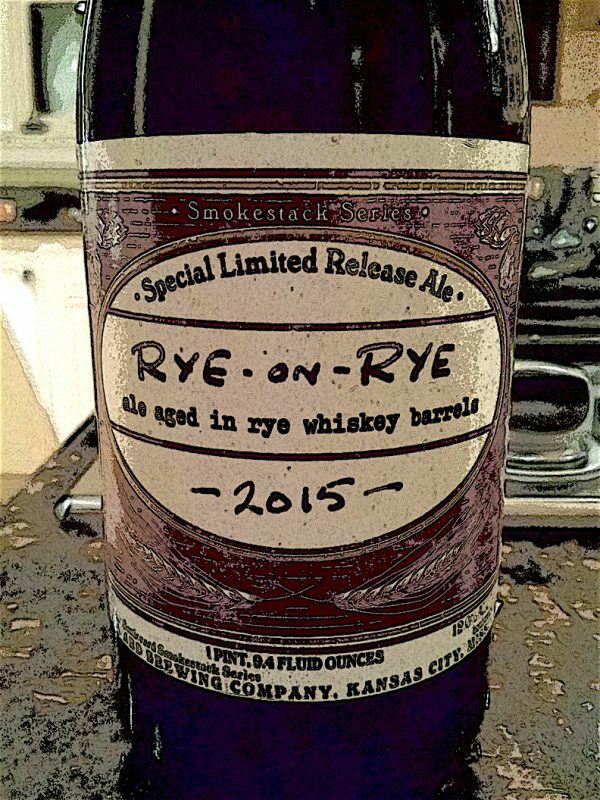 Out of the gate, Rye-on-Rye has a somewhat odd flavor. I’d call it more soapy at first. Some baby aspirin. It takes me a minute to get my tastebuds around this ale. Rye-on-Rye settles with ample toasted caramel and firm booziness. Whiskey barrel influence seems assertive. I get woodsy and complimentary flavors. The rye is evident with some spicy undertones. In conclusion, 90 points. Stop me if I’ve told you this one before. 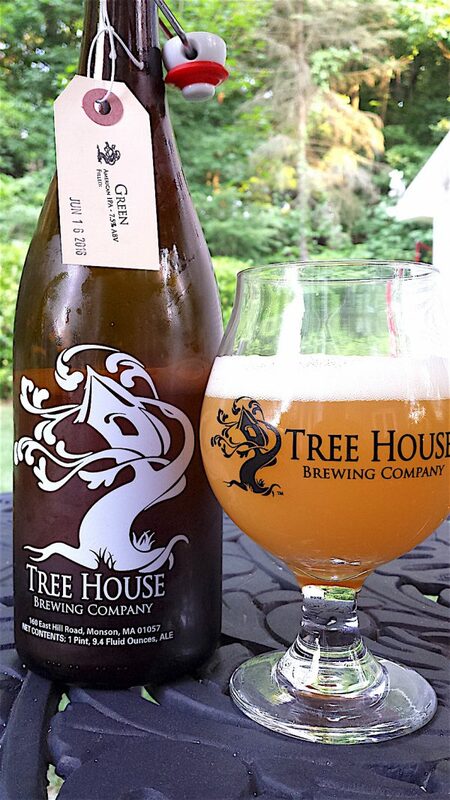 Tree House beer is legendary and available exclusively at the Monson, Massachusetts brewery. Part of the allure is that you never know what you’ll get in any given week. The one thing you do know is that whatever it is, you wont get as much as you want. On a Wednesday, it’s cans only. You’ll get a maximum quantity of about ten – twelve cans of two different beers. They get hit pretty hard on Wednesday and they lower the can limits for these two offerings on Thursday but introduce a third release. Growler fills begin on Thursday and of late, limits have been a total of 3 glass bottles (most likely 2 -750ml & 1- 2L). In many cases, they will release a fourth beer on Friday. I plotted a twenty week history of their releases hoping to discover a pattern. In all but two weeks, Julius or Alter Ego were released on Wednesday. Expect to get one or the other. I noticed that Green was released every fifth week and it was due on our week. For us, Alter Ego and Green were the first two cans released the day before our trip. We hit the road, knowing that we should get 2 cans of Green and 2 cans of Alter Ego (provided we were in the first six-hundred people on line). It would be hours into our trip before we learned the mystery third release. While at Night Shift, Mike asked me, “What release would disappoint me the most?” To me, it sounds like picking the ugliest Miss America contestant but I settled on Eureka Citra. I mean, it’s a blond ale (not an IPA or pale ale) with only a 4.1% ABV. His response while checking his phone was, “well, you’re not going to be happy. We can’t complain. We just loaded up on Night Shift and we were heading to Trillium. Tree House is a bonus stop. The pressure to get there early lifted so we made our scheduled side stop at Jack’s Abbey in Framingham (just 10 minutes detour on the road from Trillium to Tree House). We arrived at Tree House at about 3:45 and got tickets 105 & 106. The opening time is 5 p.m. but the doors opened early at 4:30. We surmised that it had to do with their parking. They don’t want people causing problems for the neighbors so, they try to get it rolling to clear the building crowd. They do a great job of organizing – you hit the can line first and then wait for your number to be called on the deli-style number board. We left the can line and they were already serving number 85 on the deli board. We pulled out of the lot at about 5:45. My haul: 2 cans and 2 liters of Alter Ego, 2 cans and 2-750’s of Green (for two separate bottle shares) and the 8 cans of Eureka Citra. 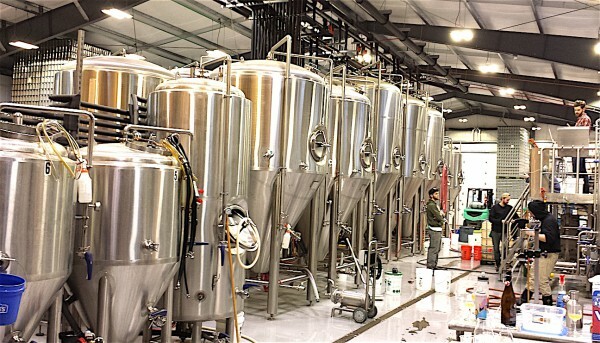 Sits squarely in the “sessionable” world and definitely displays the culinary art of creating craft beer. 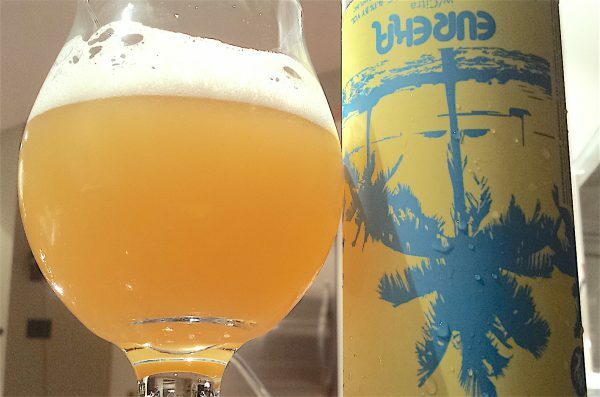 Eureka Citra is very tropical and it has flavor beyond expectation. Lot’s of fruit punch, papaya and mango. Wow, definitely the best sessionable ale I’ve ever had, entirely drinkable. 93 points.